While planning for kids Winter craft ideas and activities remember the philosophy of T.I.M.E. and always think of ways to create activities that are closely related to your child's interests. Learn about my T.I.M.E. philosophy by visiting my Preschool Ideas page. 1. Cut out the circles for the body and the hat. 2. Place the doily on the smaller circle. 3. Paint over the doily with the white paint. 4. Remove the doily and let the paint dry. 5. Add the facial features. 6. 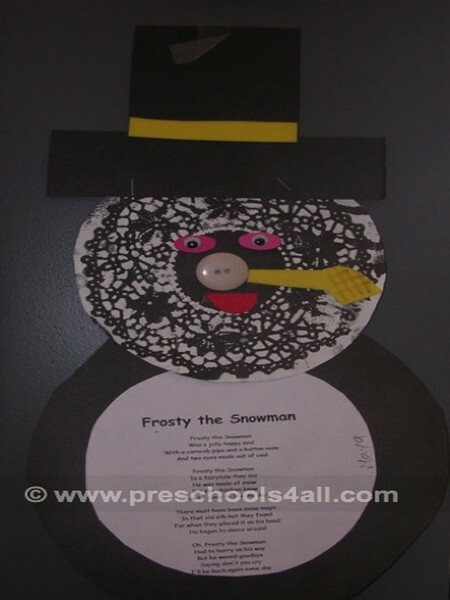 Glue the hat and circles together along with Frosty The Snowman song. 1. Fold the paper into 1/8. 2. Cut out a circle. 4. 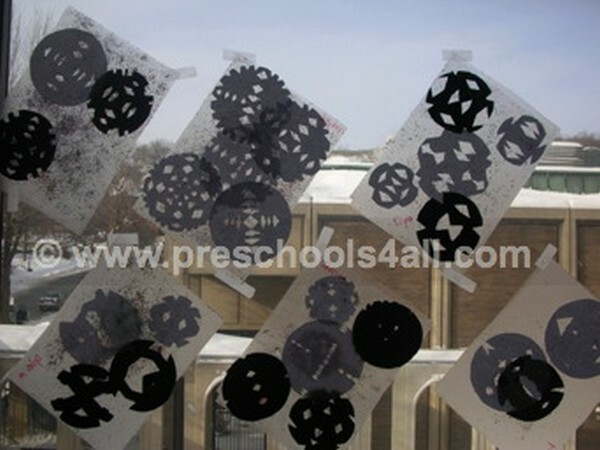 Unfold and reveal a snowflake shape. 1. 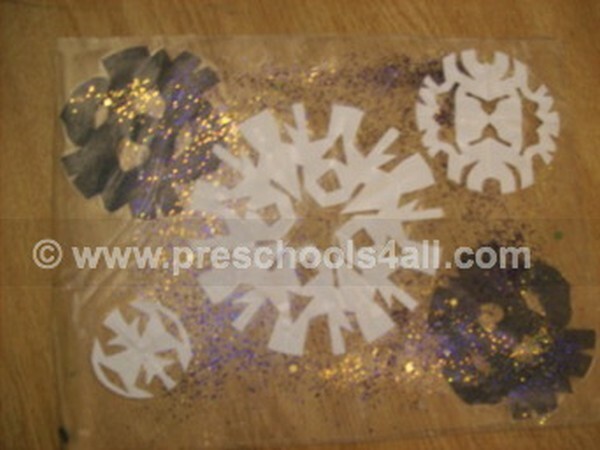 Place the snowflakes on the sticky part of the mac-tac paper. 2. Cover it with another mac-tac paper for a mobile or place it directly on the window for window decoration. 1. 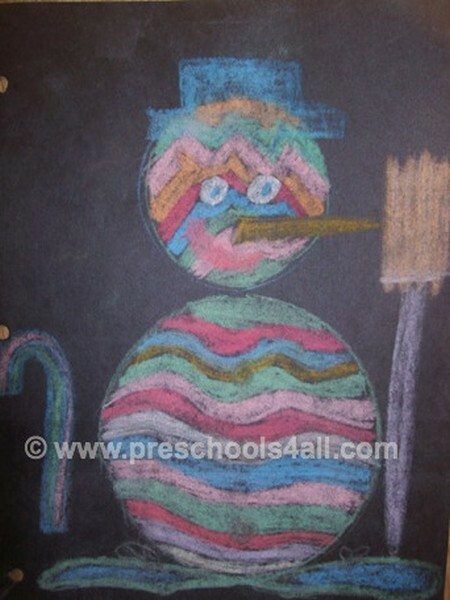 Using the tracers, trace the shapes on the paper to create a snowman. Just in time for winter this cool activity allows children to enjoy watching the properties of paint. 1. 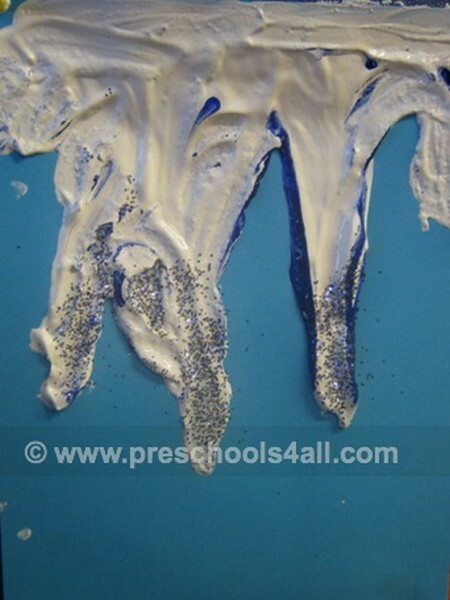 Paint the paper with a mixture of blue and white paint to create a lighter color blue. 2. Squirt large amounts of white paint at the top of the page. Add drops of blue to it. 3. Lift the page and let the white paint to flow down the page. 4. Add silver glitter for an icy look. 5. Place by the window for a beautiful winter scene. Vocabulary words: Right, left, opposites and a pair. 1. 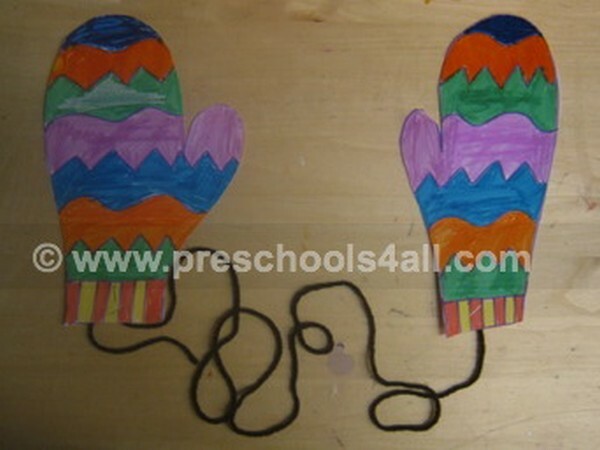 Cut out the shape of mittens out of the paper. 2. With a pencil draw the design on the mittens. 4. Connect the mittens with the string. 1. 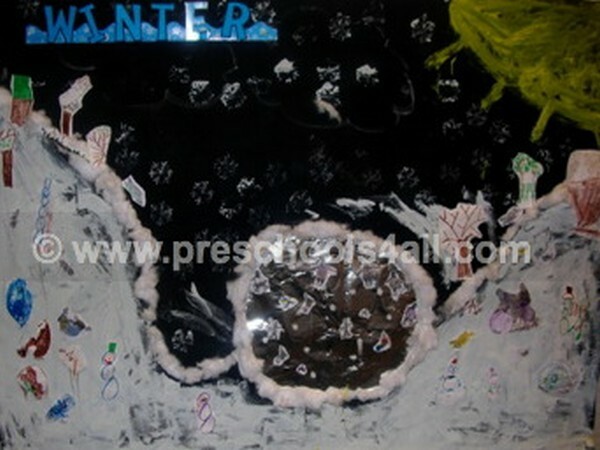 Allow the children to paint a winter scene while working together as a team. Experiment with painting and printing on material.